Sweet Pea is a flowering plant in the genus Lathyrus and in the family Fabaceae. This flower is considered to be a vining plant, curling and climbing up nearby posts, fences, trellises, or other tall objects nearby. Sweet peas often reach a height of ten feet, but more common is the variety that is smaller and more bush-like. These kind only grow up to 30 inches. Unlike most peas, which are safe and healthy to be eaten, the seeds of the sweet pea are poisonous. They contain a small amount of neurotoxin. People or animals can become ill from eating these seeds. The illness caused from eating sweet pea seeds is known as odoratism, or sweet pea lathyrism. Sweet peas come in a large variety of colors. They can be purple, pink, red, blue, white, or a mixture of these colors. The leaves are pinnate. It has two leaflets and a little tendril. It twines around nearby objects for support. Many times you will find the sweet pea twined around tall fence posts or other objects using its tendrils. 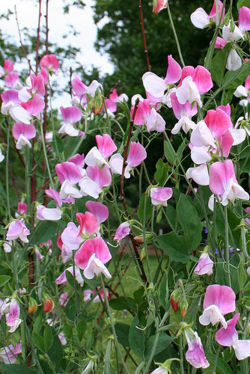 The sweet pea flower is about two centimeters broad, but can get to be almost four centimeters broad in good conditions. They can get even larger in the wild. 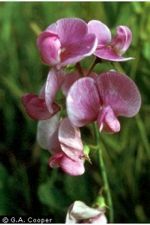 The sweet pea contains fourteen chromosomes, all which control the many aspects of the growth, color, and reproductive processes throughout its life. The male reproductive cells are in the pollen, and the female reproductive cells are in the ovary, which form the seed. Fertilization and then seed formation occurs after pollination. The reproduction of the sweet pea plant has been greatly studied by scientists, including one in particular: Gregor Mendel. He was known as the "Father of Modern Genetics" for his work with the cross breeding of pea plants with different characteristics. The sweet pea played a large part in his discoveries. 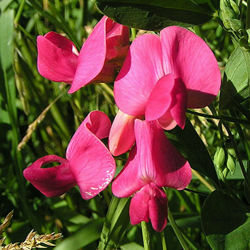 The sweet pea is native to the eastern Mediterranean region. They grow very well in mild, cool climates. For optimum growth success, sweet peas should be planted in rich, moist soil. They require regular watering during hot months or else they will dry up and die. Planting the seeds should be done around March. For fastest germination, soak the seeds in water that is room temperature for a while; then plant them in a sunny area in the garden. Mulching the soil is a smart way of keeping the sweet peas healthy and vibrant. You can do so by placing organic material on top of the soil to prevent loss of moisture. To keep the flowers blooming longer, keep plucking off the old, dead blossoms to allow new ones to grow. This page was last modified on 3 April 2009, at 21:43.